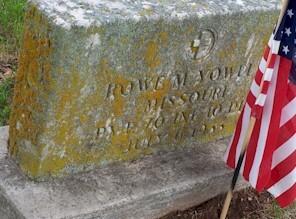 Below are a few notes based on people buried at the Smith Cemetery in Phelps County, Missouri. 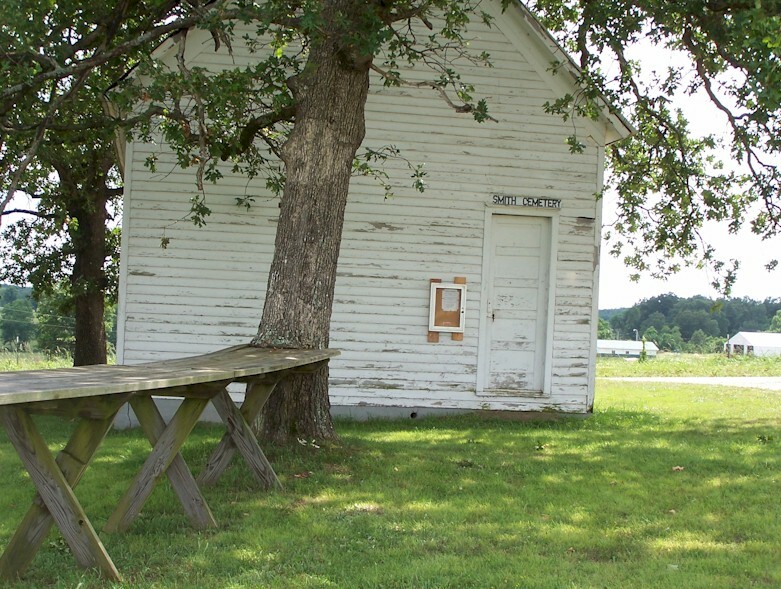 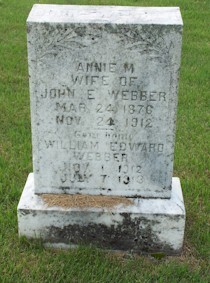 Phelps County is the home of John Webber, son of John Monroe Webber. 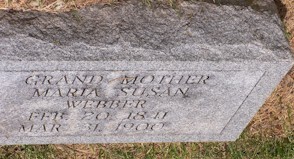 These are families related to this line. 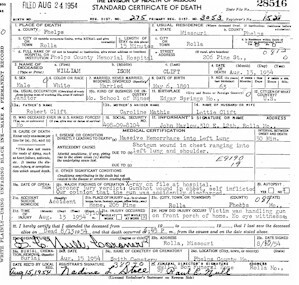 Directions to cemetery: Turn west of Highway 63 and go about 3 miles west out of Edgar Springs on State Route M. You will go past a school and 4 curves (two are about 90 degree curves). 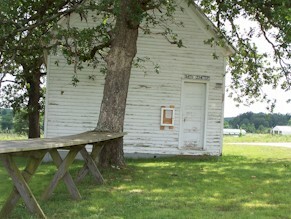 Turn right onto County Road 220. 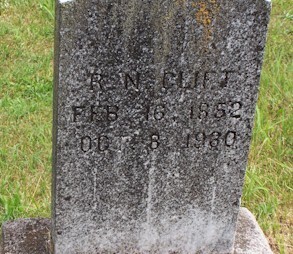 This is a small sign on Route M that says Smith Cemetery. 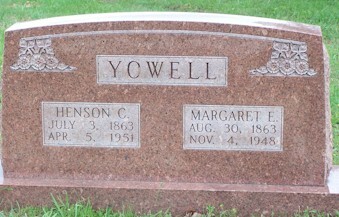 Follow this dirt road for a couple miles (forgot to clock it). 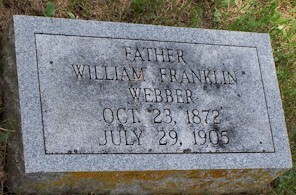 The cemetery is obvious and right on the road. 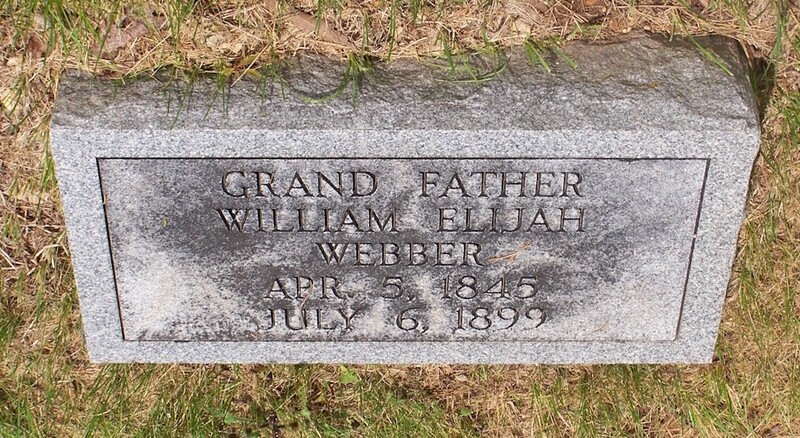 William Elijah "Lige" Webber was the son of John and Eliza Jane (Powell) Webber. 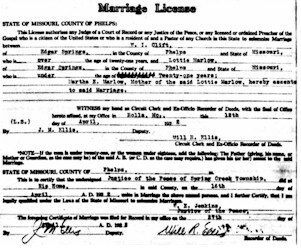 Maria was the daughter of Edward Downing and Martha Gray (Jones) Williams. 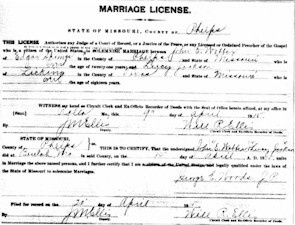 Lige was born April 5, 1845 in Rolla, Phelps County, Missouri and died July 6, 1899 in Corn Creek, Phelps County, Missouri. 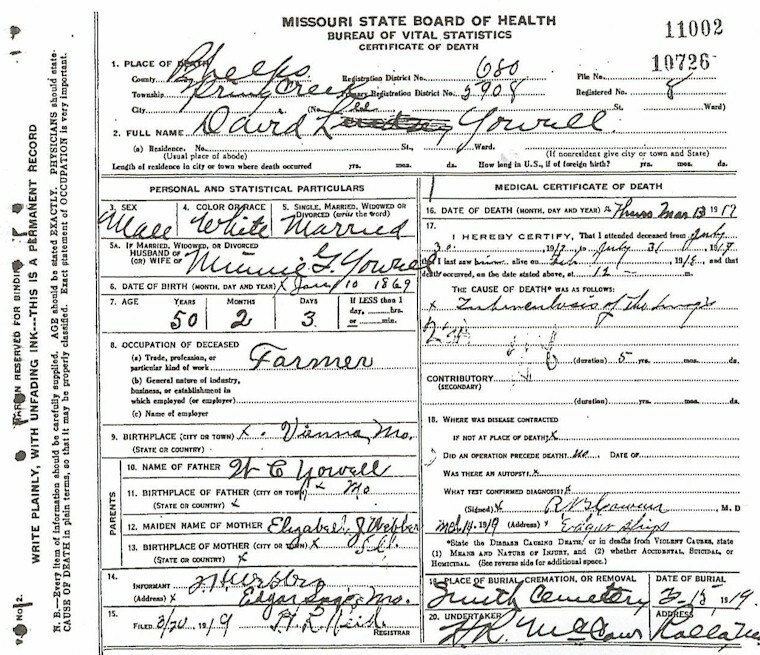 Maria was born February 20, 1841 in Bedford County, Virginia and died March 31, 1900 in Corn Creek, Phelps County, Missouri. 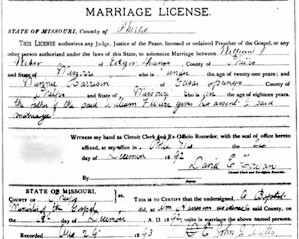 Lige and Maria were married March 19, 1868, in Phelps County, Missouri. 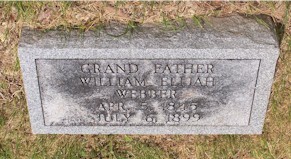 John Edward Webber was the eldest son of Lige and Maria. 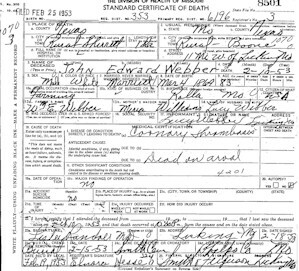 John was born March, 1879 and died February 10, 1953. 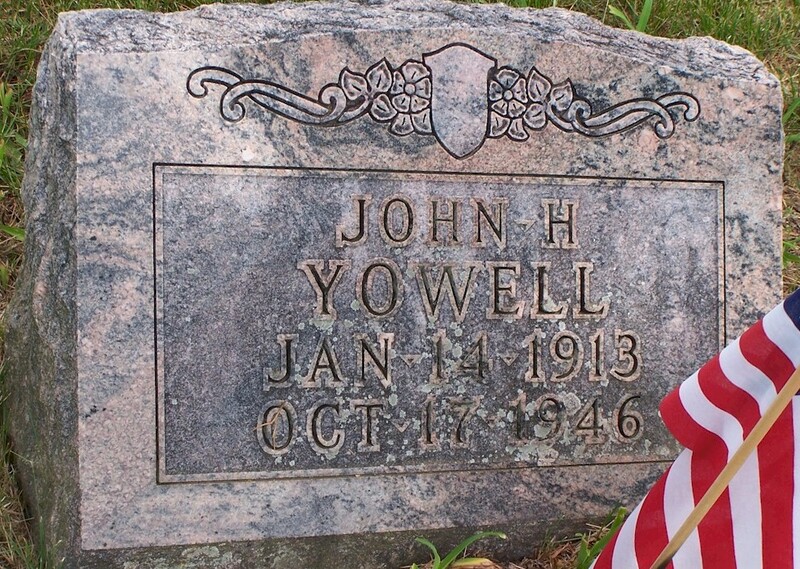 Both of his wives are buried in Smith Cemetery, however I didn't see a stone for John himself. 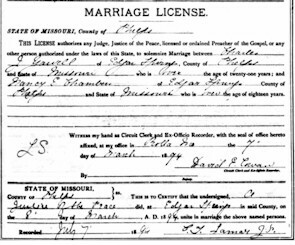 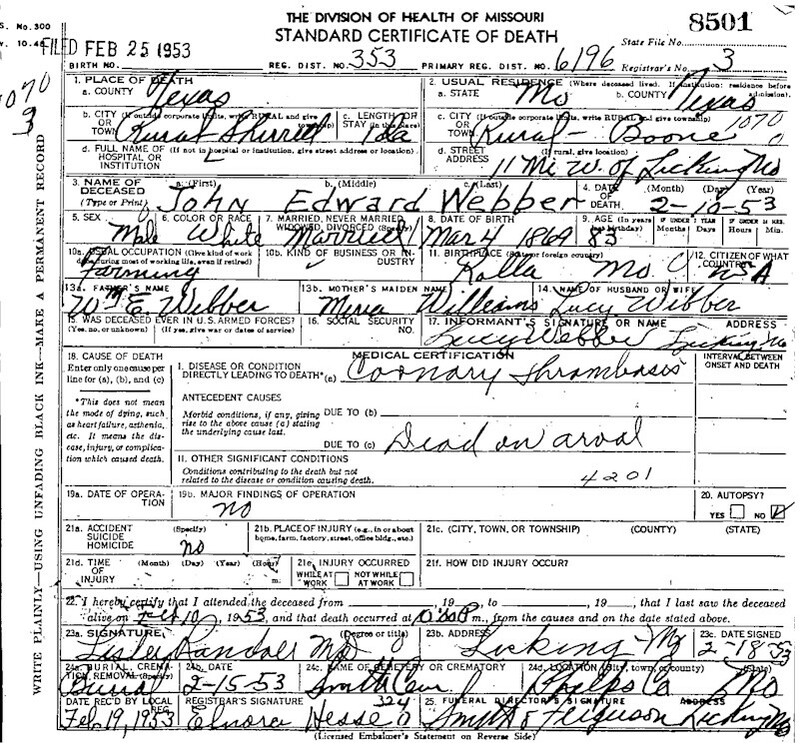 John first married Anna (Annie) Dunham on October 7, 1896 in Phelps County, Missouri, and then after her death he married Lucy Stubblefield on April 9, 1915 in Phelps County, Missouri. 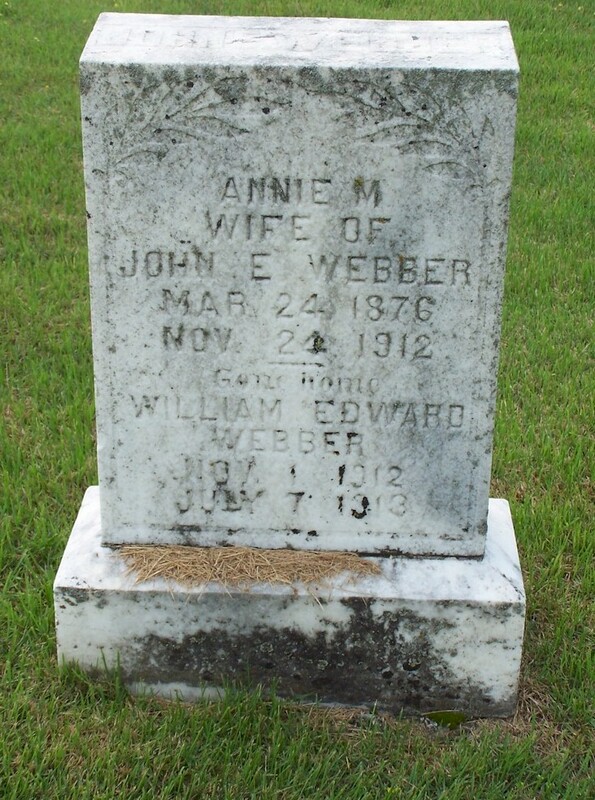 Anna was born March 24, 1876 and died November 24, 1912. 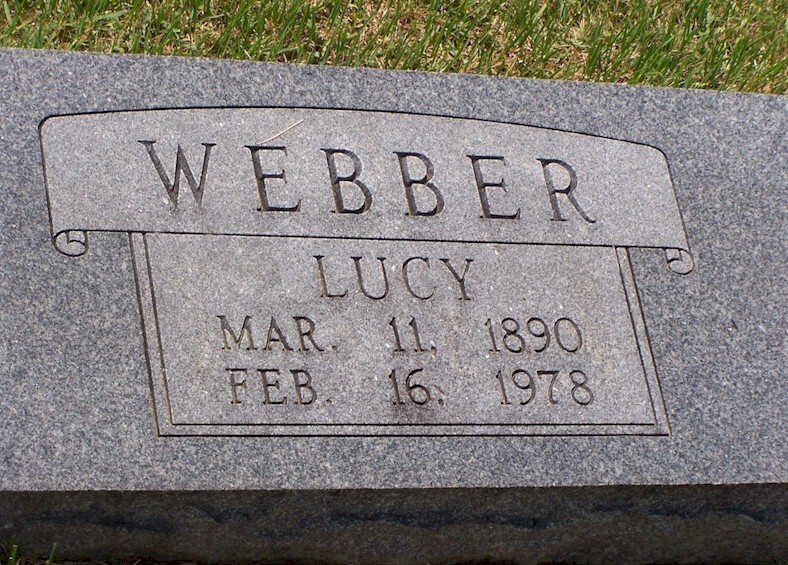 Lucy was born March 11, 1890 and died February 16, 1978. 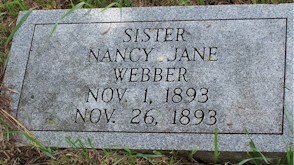 Nancy Jane Webber is the oldest child of William Franklin and Minnie (Harrison) Webber. 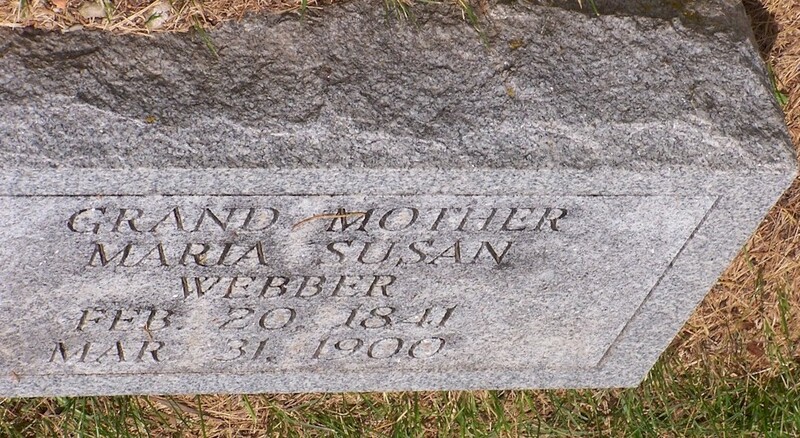 She was born November 1, 1893 and died November 26, 1893. The third child of Lige and Maria was the daughter, Minnie Gray Webber. 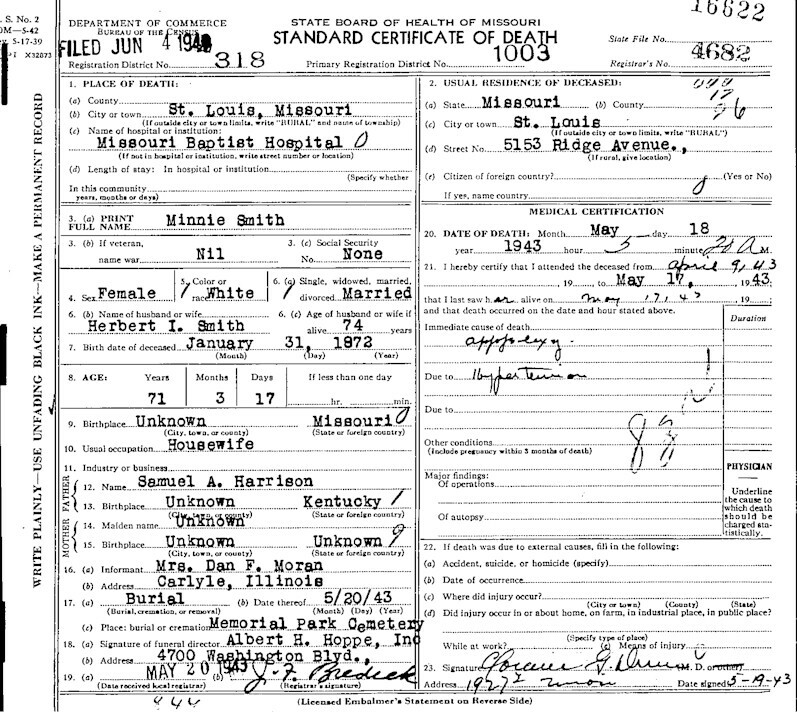 Minnie was born September 23, 1874 in Missouri and died July 22, 1971 in Phleps County, Missouri. 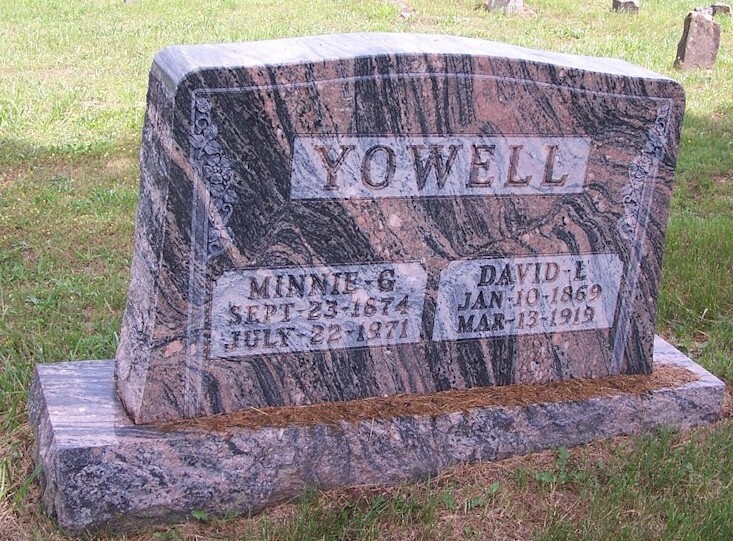 In 1892 according to the 1900 census, Minnie married David Lee Yowell. 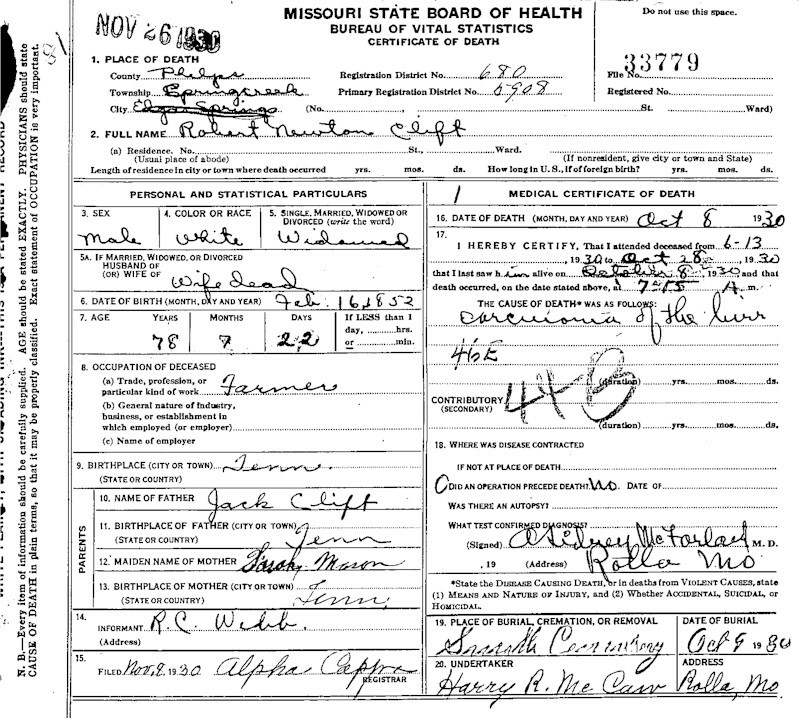 David was born January 10, 1869 and died March 13, 1919 in Phelps County, Missouri. 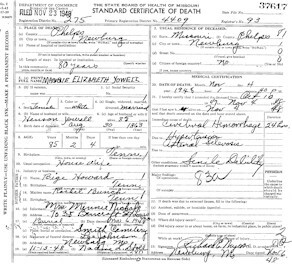 Note: More on this family see below. 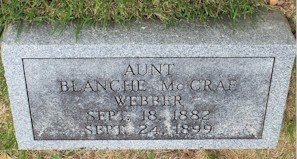 The sixth child of Lige and Maria was a daughter, Blanche McCrae Webber. 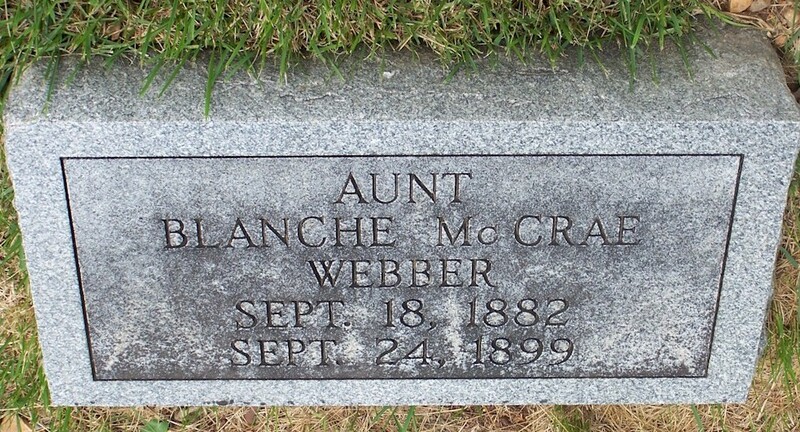 Blanche was born September 18, 1882 and died September 24, 1899. 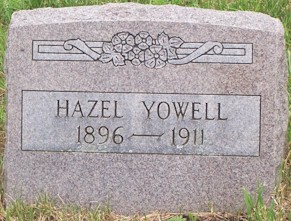 The eldest child of William Coppedge and Elizabeth Jane (Webber) Yowell was Hensen Catlitt Yowell. 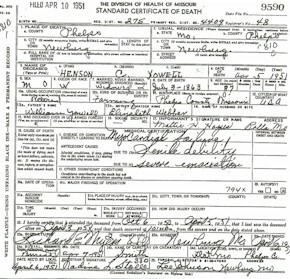 Henson was born July 3, 1863 and died April 5, 1951. 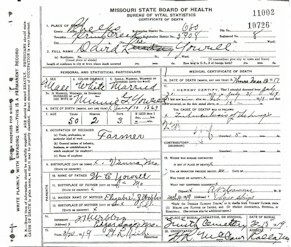 Hensen married Margaret "Maggie" Howard on August 7, 1884 in Phelps County, Missouri. 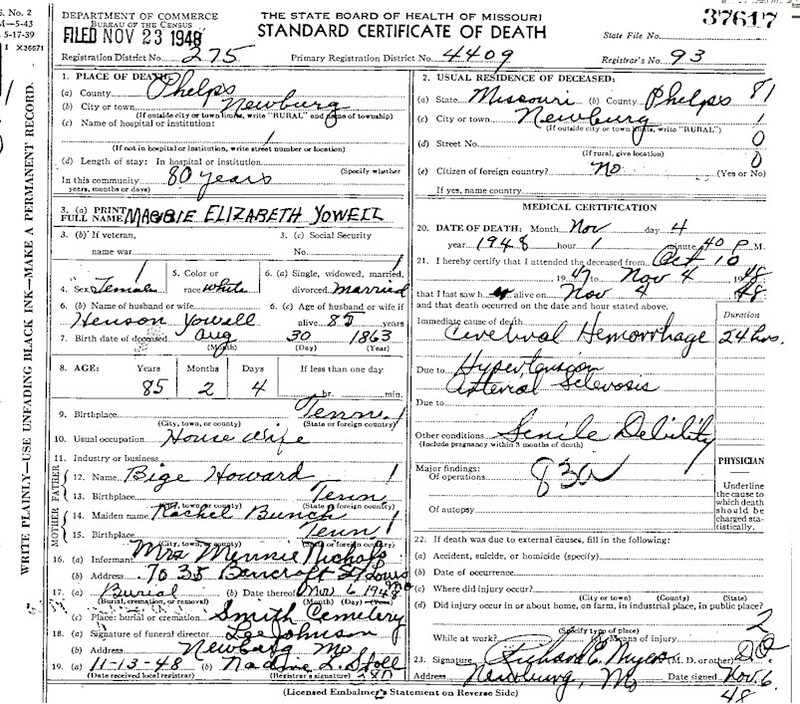 Maggie was born August 30, 1863 and died November 4, 1948. 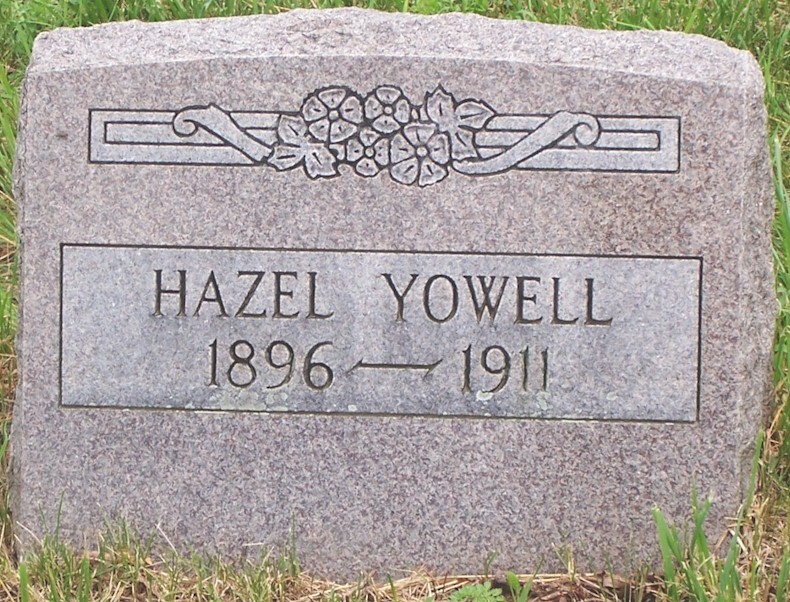 She was the daughter of Bige and Rachel (Bunch) Howard. 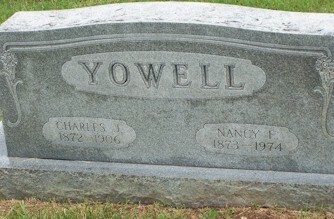 Charles was the third child of William Coppedge and Elizabeth Jane (Webber) Yowell. 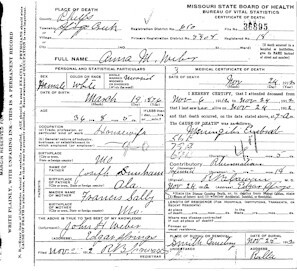 Charles was born in March of 1872 and died in 1906. 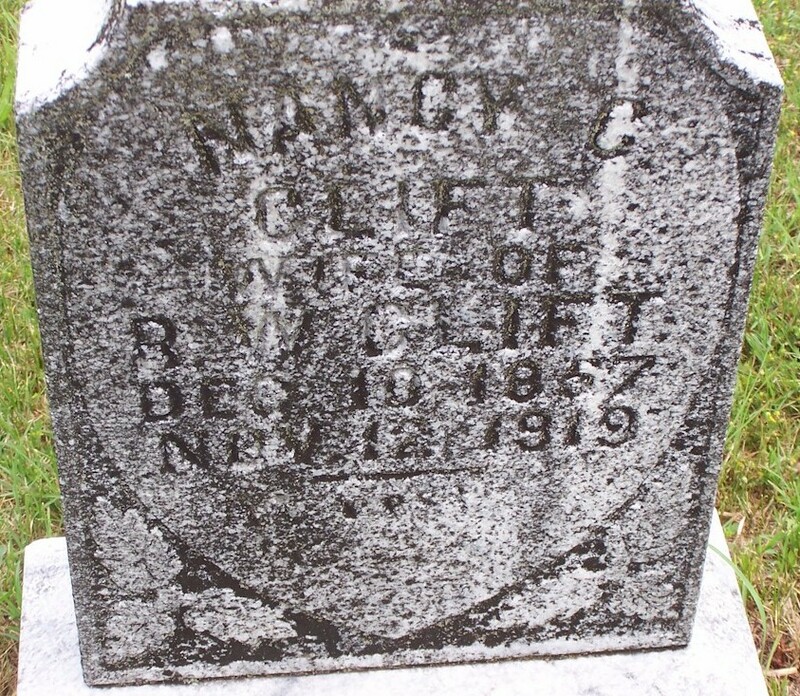 Nancy was born July 7, 1872 and died in January 20, 1974. 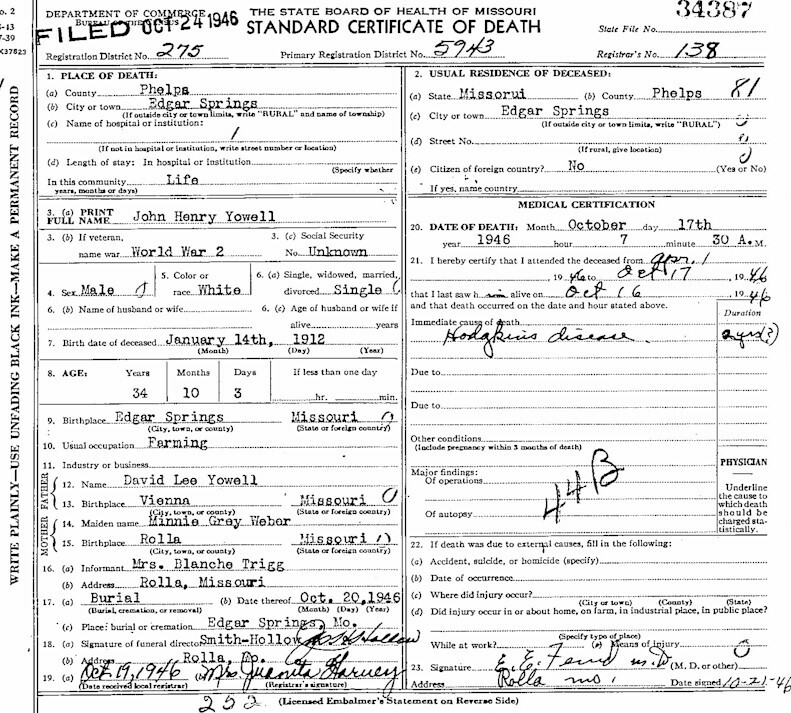 There are several discripancies with records and dates. 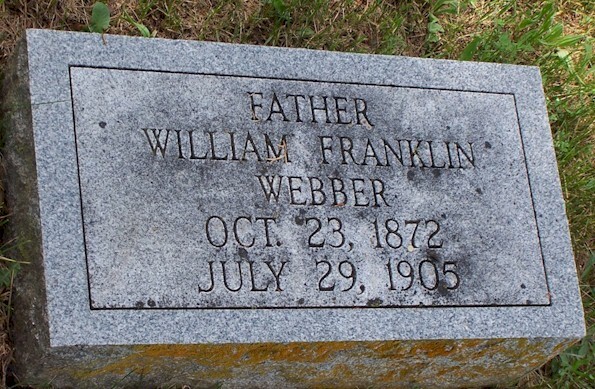 These dates came from FindaGrave. 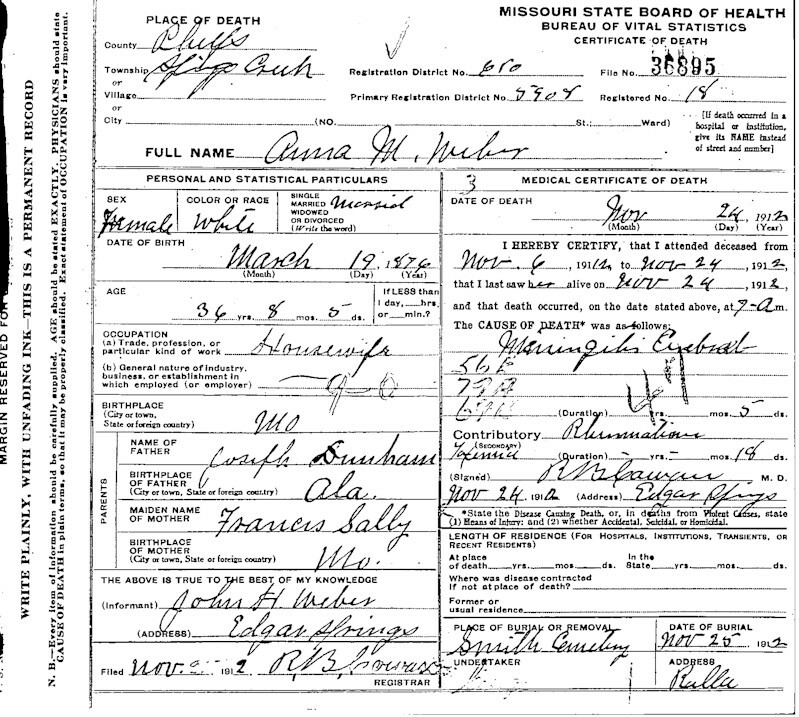 1900 Census lists Charles birthdate as March 1874 and Ellen's as April 1874. 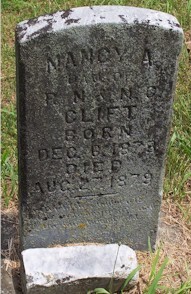 The tombstone lists Nancy Ellen's birthdate as 1873. 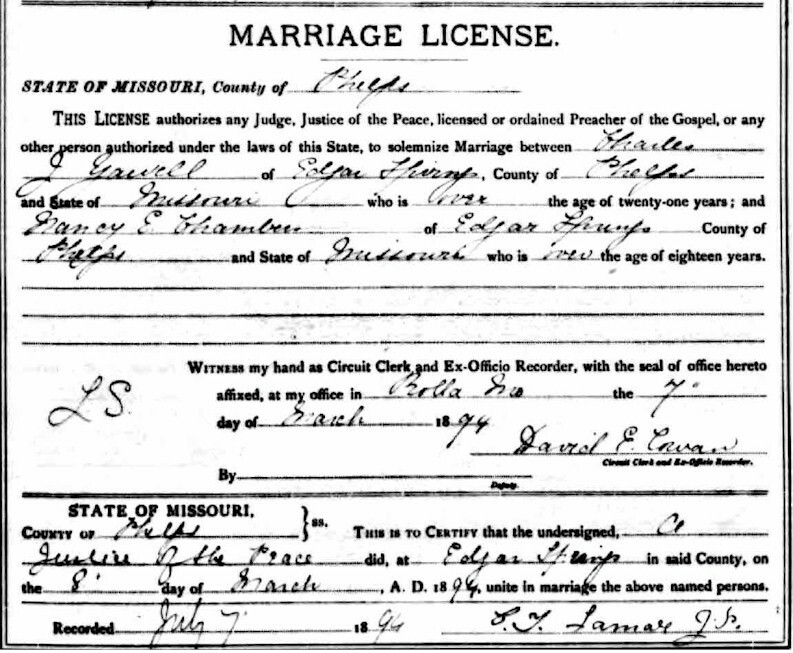 Marriage liscense didn't add any info of age. 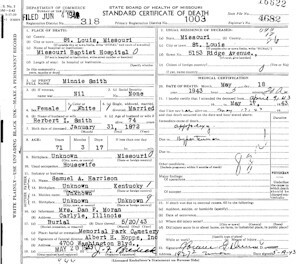 Note: More on this family see below. 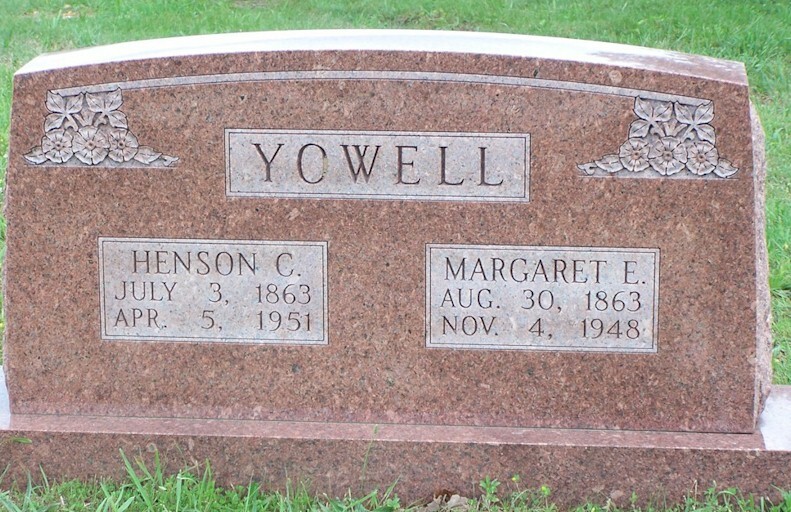 Selma Hazel Yowell is the daughter of Charles Jackson and Nancy Ellen (Chambers) Yowell. 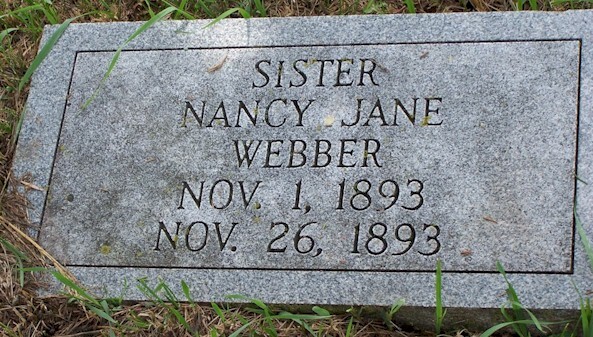 She was born September 23, 1896 and died in July 23, 1911 in Phelps County, Missouri. 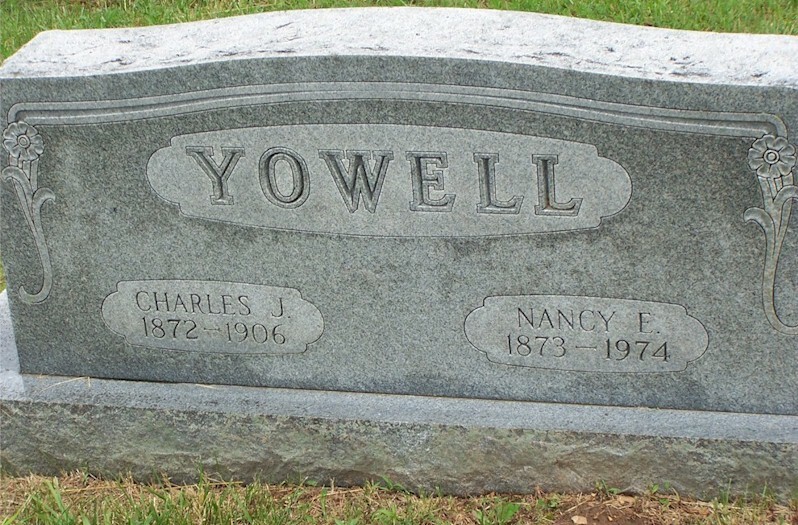 Nellie Inez Yowell is the third child of Charles Jackson and Nancy Ellen (Chambers) Yowell. 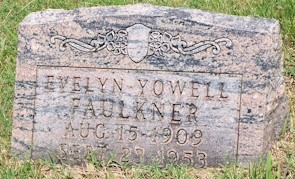 She was born October 17, 1898 and died in August of 1992 in Beggs, Oklahoma. 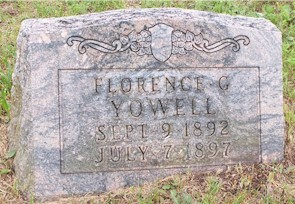 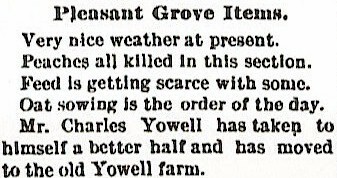 Florence Grace Yowell was the eldest child of David Lee and Minnie Gray (Webber) Yowell. 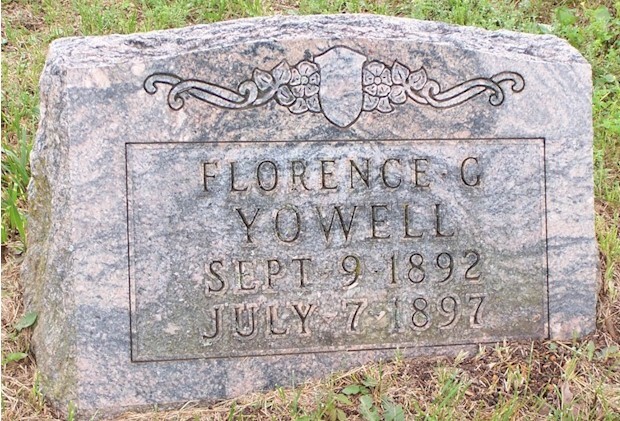 She was born September 9, 1892 and died July 7, 1897. 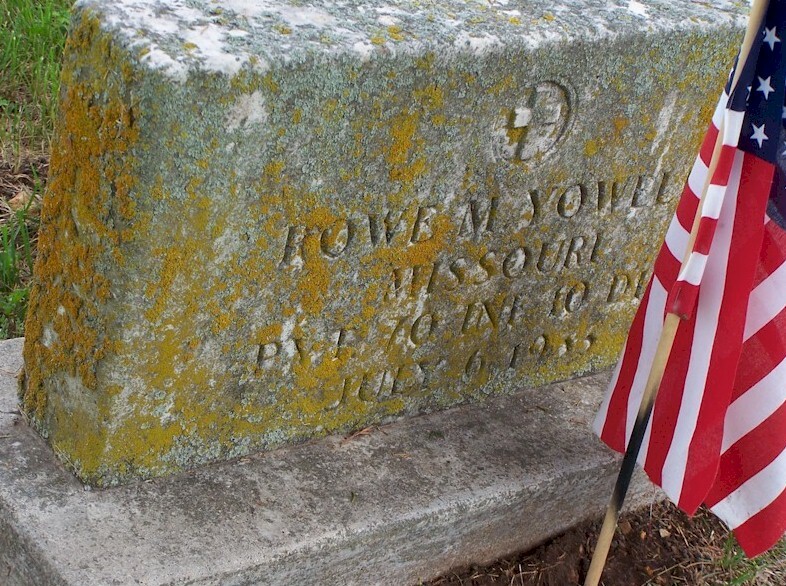 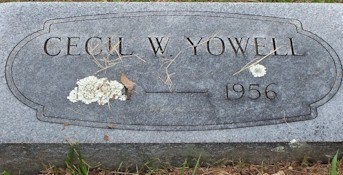 Rowe Madison Yowell was the second child of David Lee and Minnie Gray (Webber) Yowell. 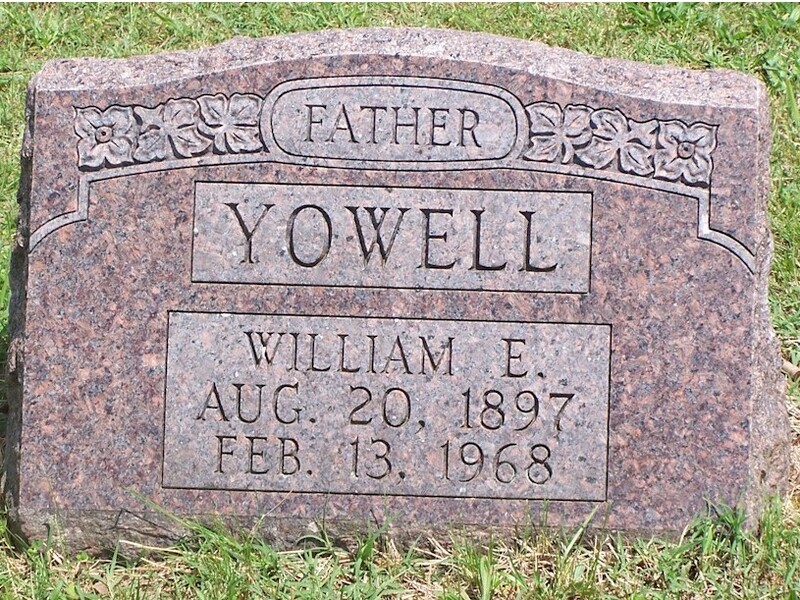 He was born January 4, 1895 and died July 6, 1933. 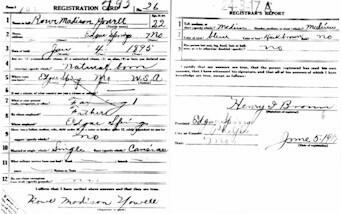 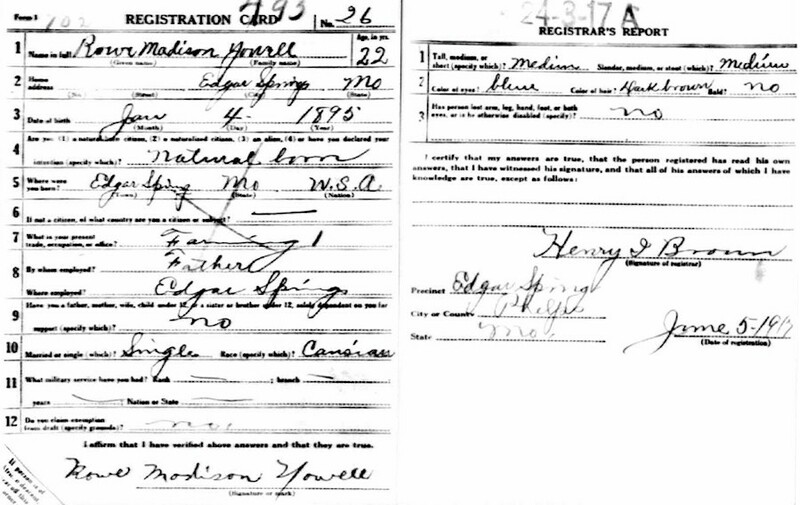 Rowe was single on his WWI card, 1910, 1920 and 1930 census. 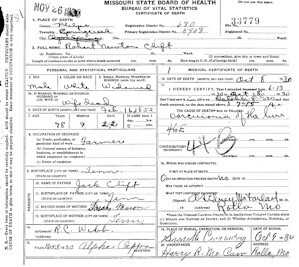 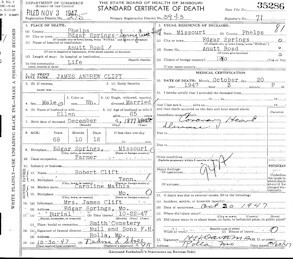 According to "Arkansas Death Index, 1914-1950" Rowe died in Clay County, Arkansas (very NE corner of Arkansas). 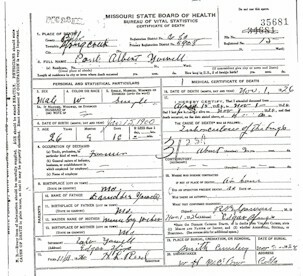 He is listed as single on the 1920 and 1930 census. 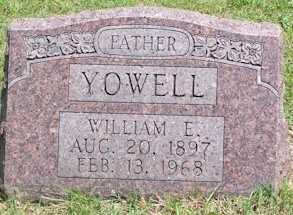 William Elijah Yowell was the third child of David Lee and Minnie Gray (Webber) Yowell. 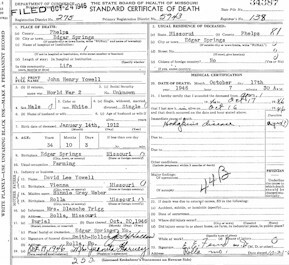 He was born August 20, 1897 and died February 13, 1968. 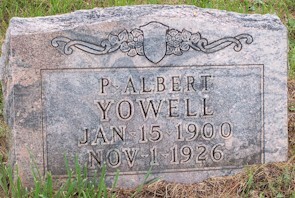 Paul Albert Yowell was the fourth child of David Lee and Minnie Gray (Webber) Yowell. 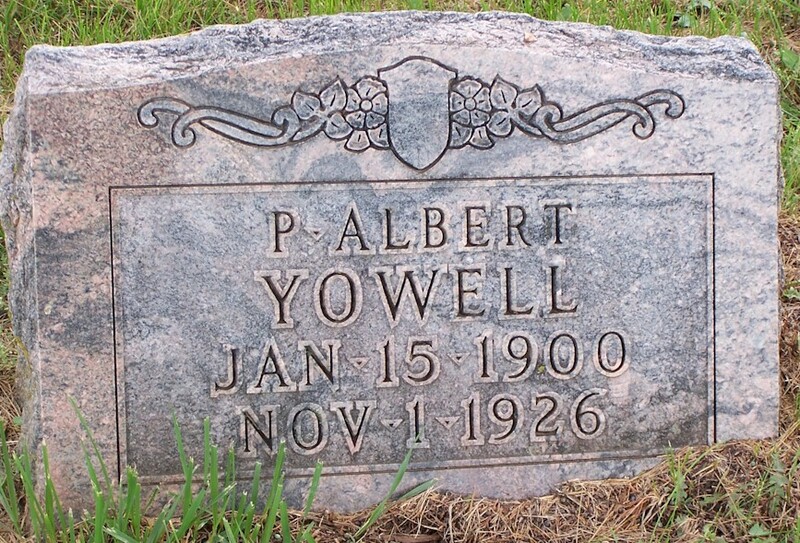 He was born January 15, 1900 and died November 1, 1926. 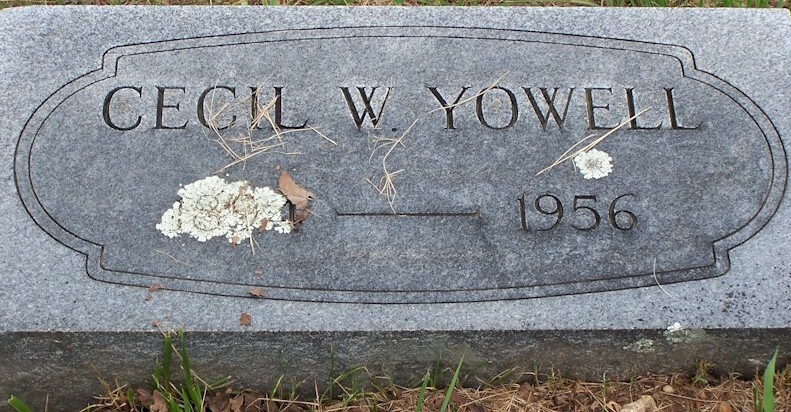 Evelyn J. Yowell was the seventh child of David Lee and Minnie Gray (Webber) Yowell. 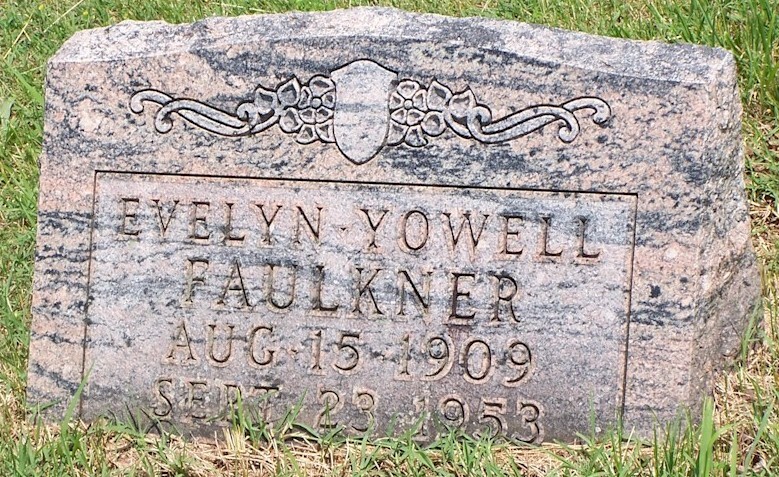 She was born August 15, 1909 and died September 23, 1953. 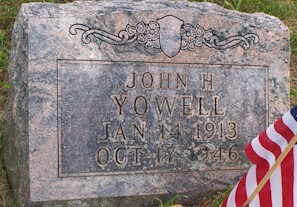 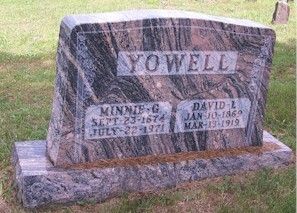 John Henry Yowell was the last child of David Lee and Minnie Gray (Webber) Yowell. 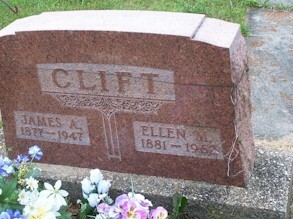 She was born January 14, 1913 and died October 17, 1946. 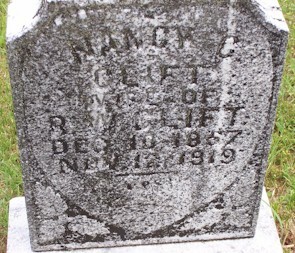 Robert Newton Clift was the son of Jack and Sarah (Mason) Clift. 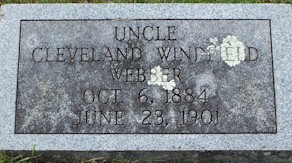 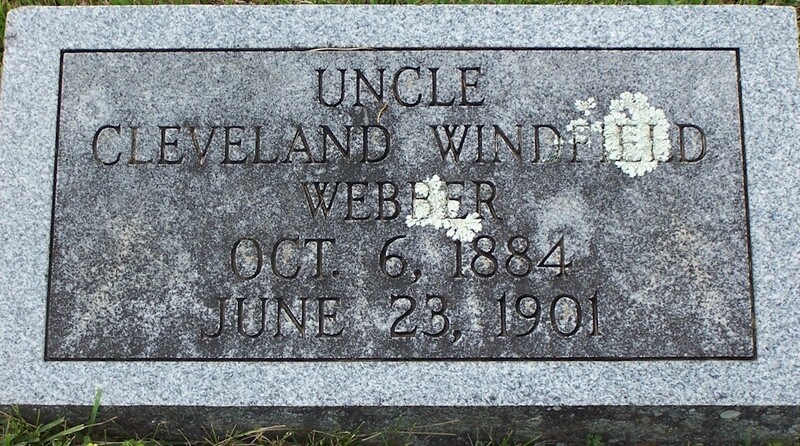 He was born February 16, 1852 and died October 8, 1930. 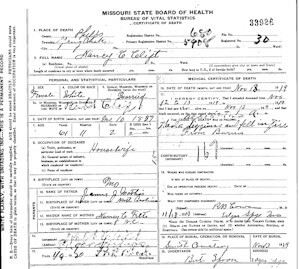 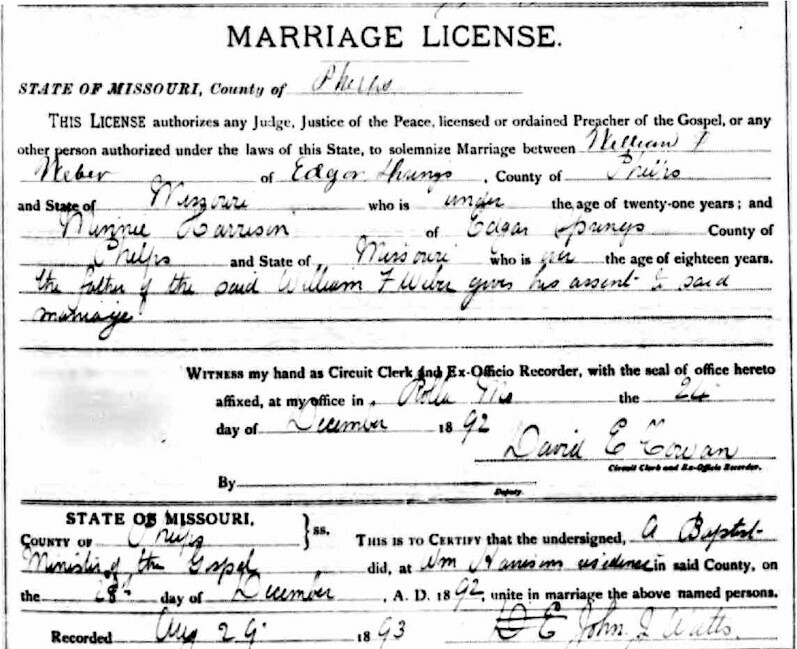 On June 6, 1875 in Phleps County, Missouri, he married Nancy Caroline Mathews (or Mathis). 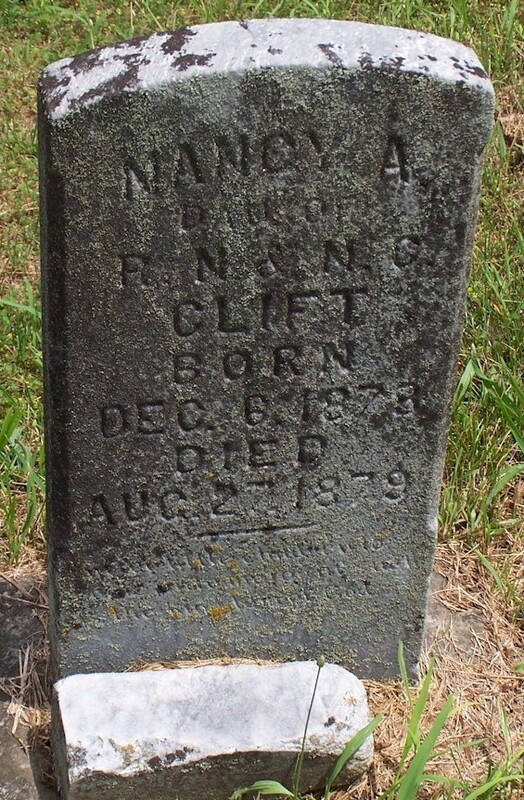 Nancy was born December 19, 1857 and died November 12, 1919. 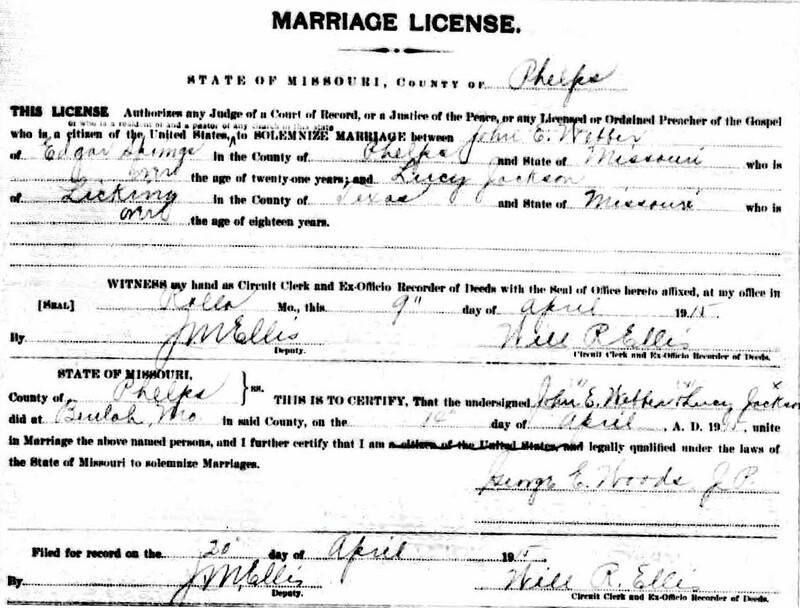 Note: Marriage record says Mathews. 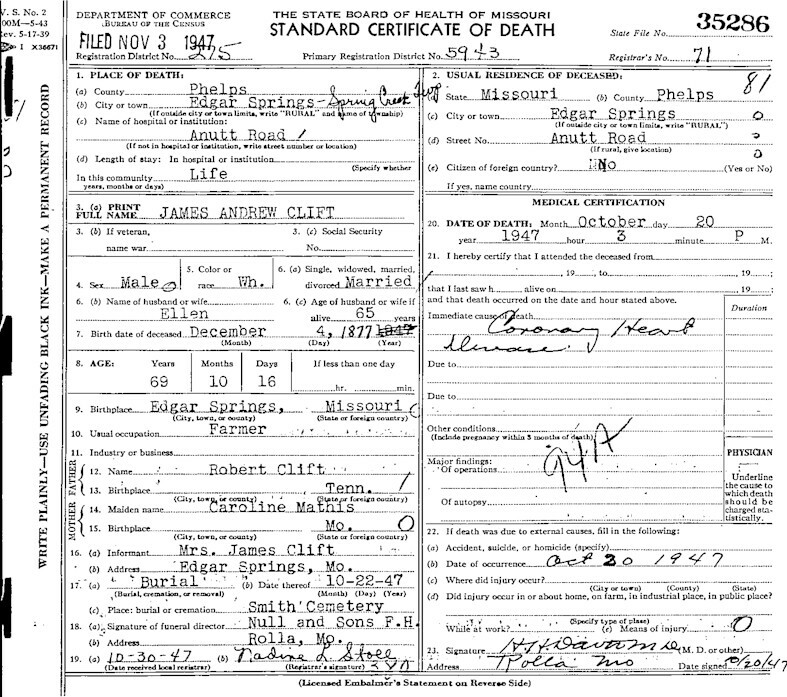 Son's death certificate and other references say Mathis. 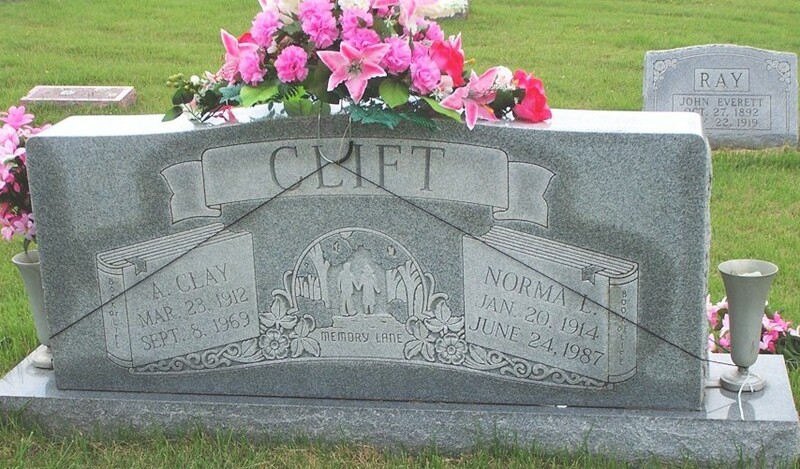 The eighth child of Robert and Nancy was William Isom Clift. 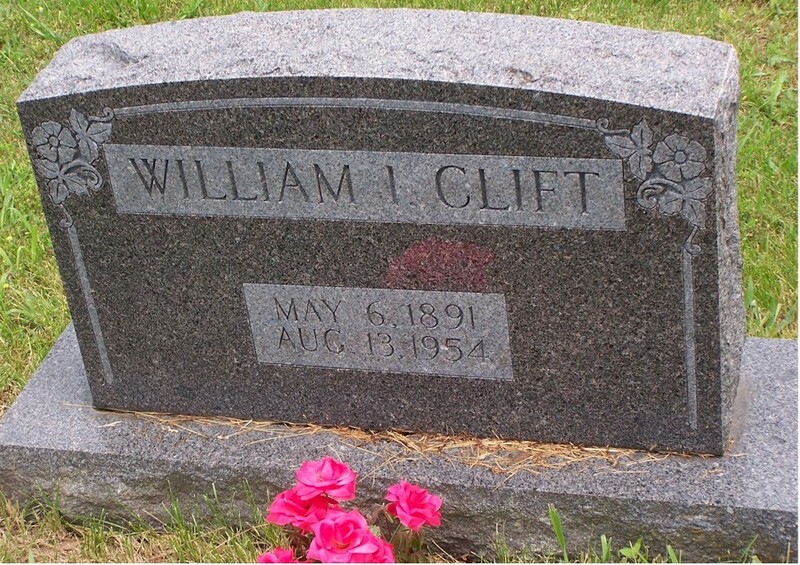 William was born May 6, 1891 and died August 13, 1954. 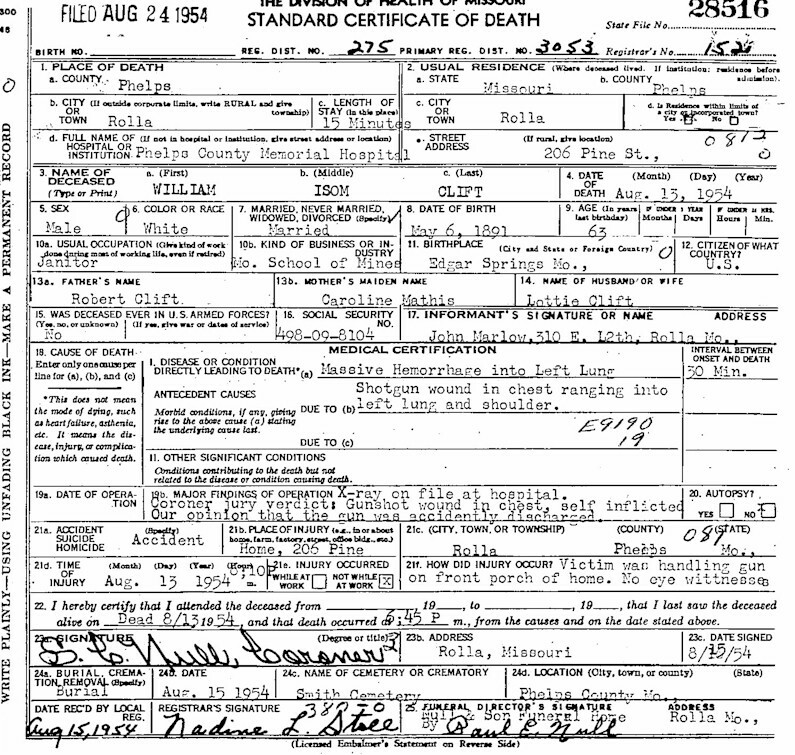 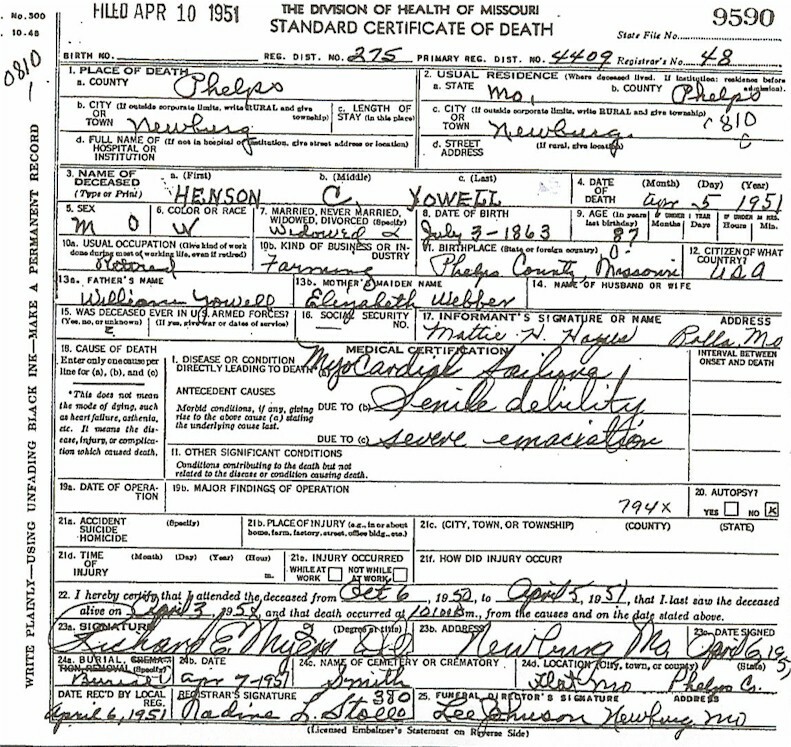 According to William's death certificate, he died of a gunshot wound to the chest. 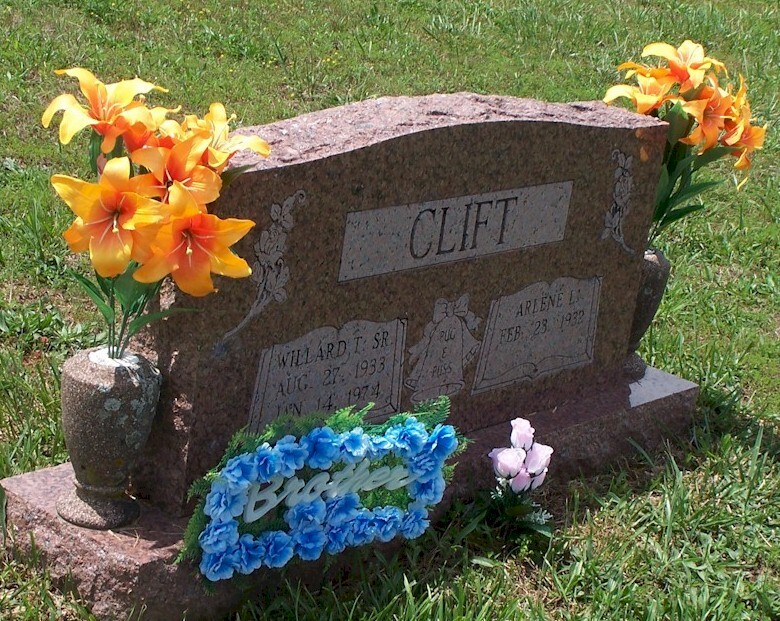 He was on his front porch with the gun and it discharged, killing himself. 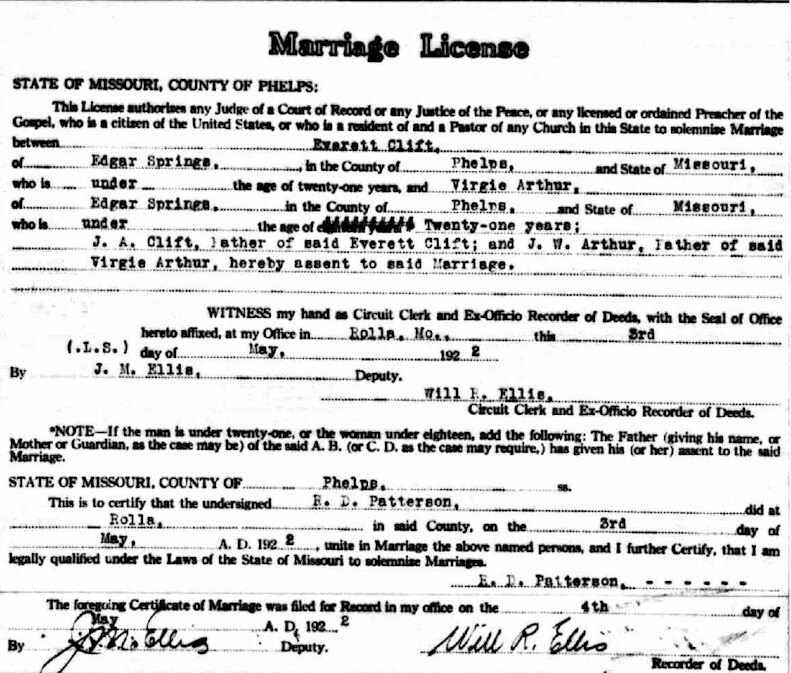 William married Emily York. 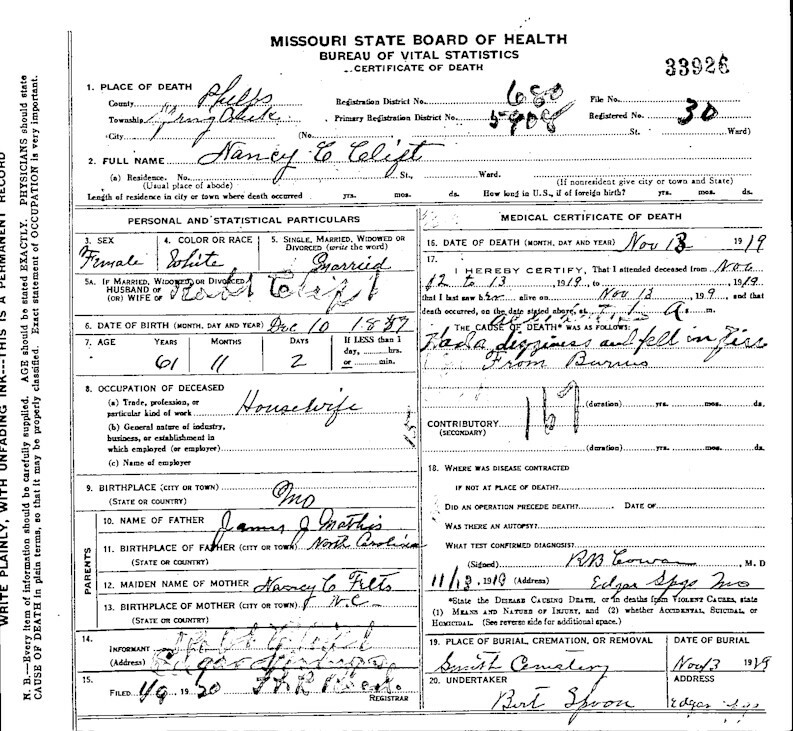 Emily was born February 19, 1890 and died July 12, 1921. 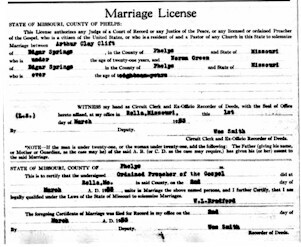 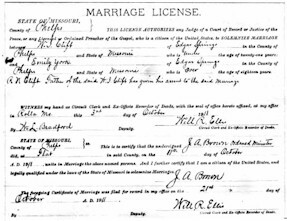 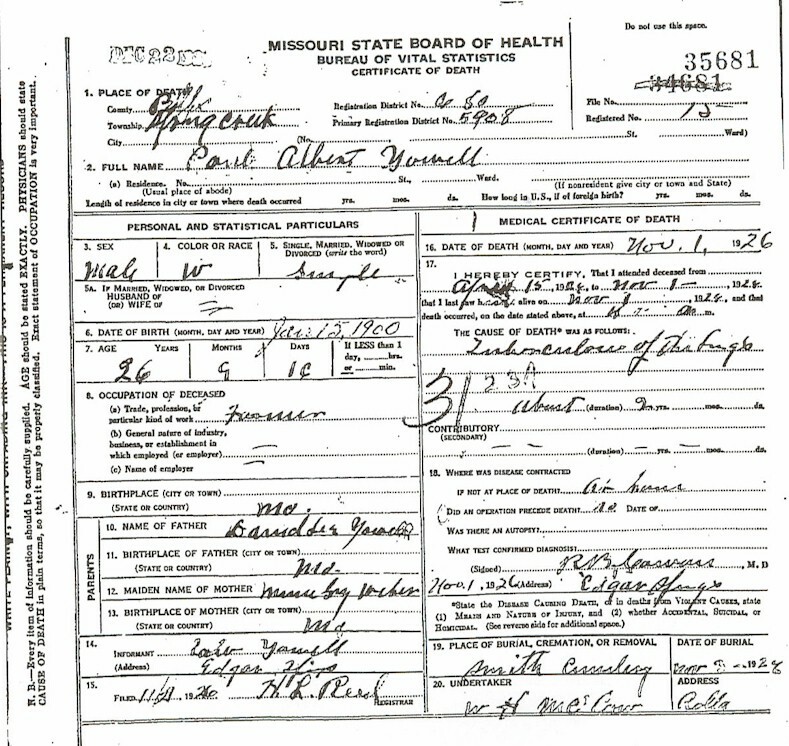 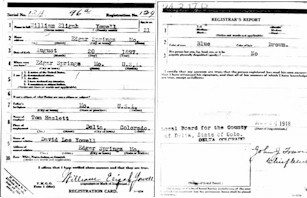 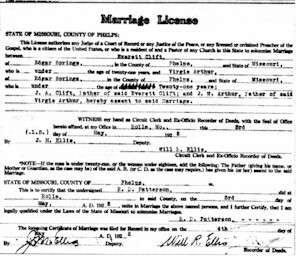 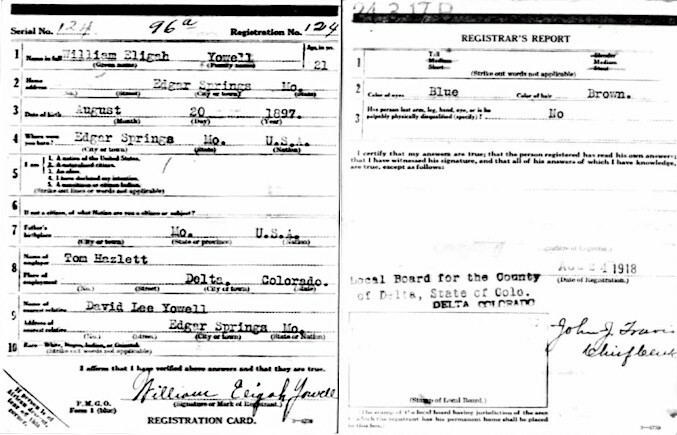 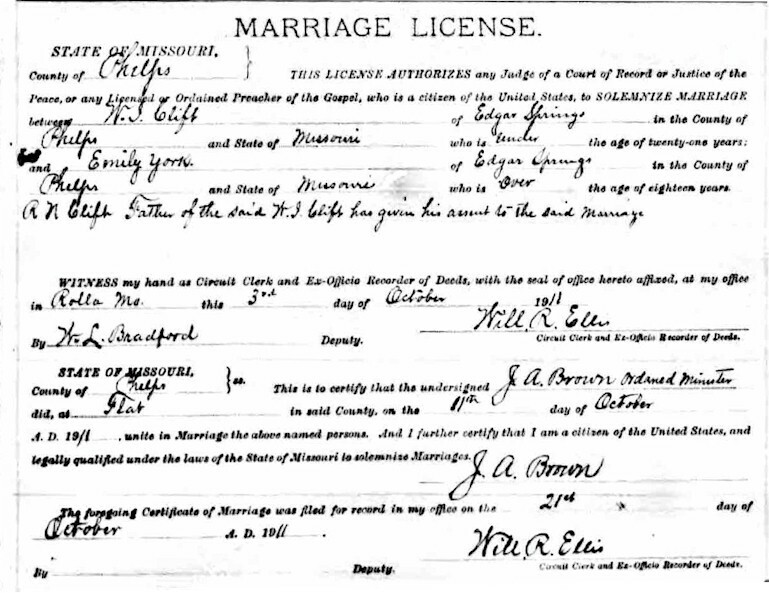 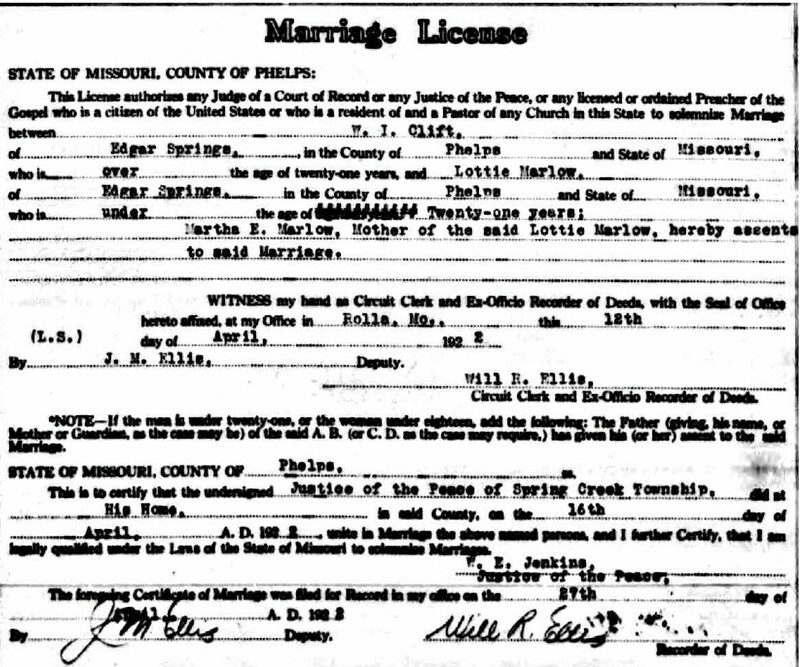 Secondly William married Lottie Marlow on April 16, 1922, Phelps County, Missouri. 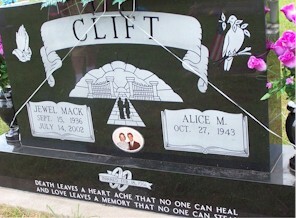 Jewell Mack Clift (son of Clay and Norma) was born September 15, 1936 and died July 14, 2002. 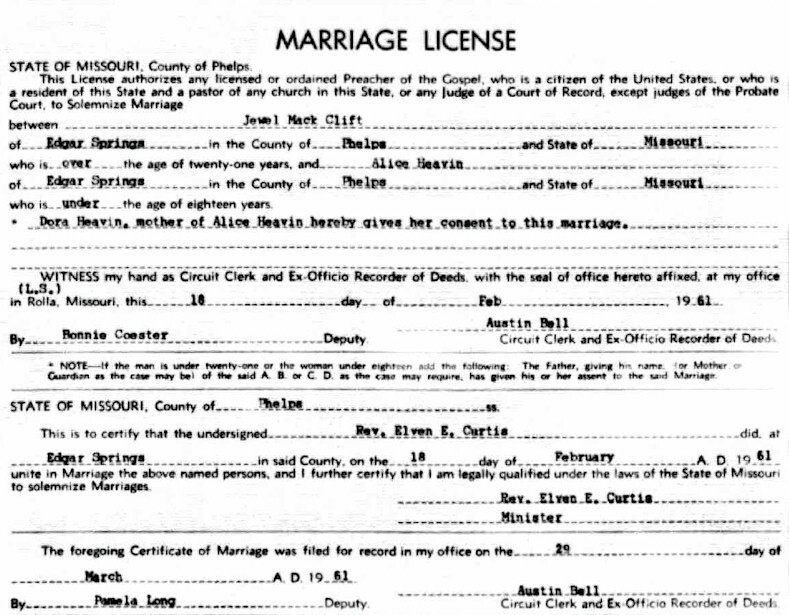 He married Alice Heavin on February 18, 1961 in Phelps County, Missouri. 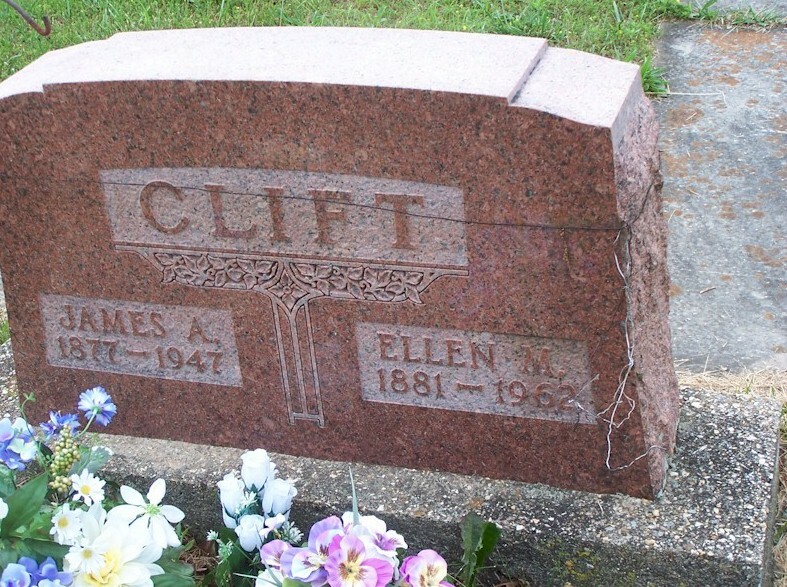 James Everett "J E" Clift was born August 17, 1901 and died October 16, 1996 and was the eldest child of James and Ellen. 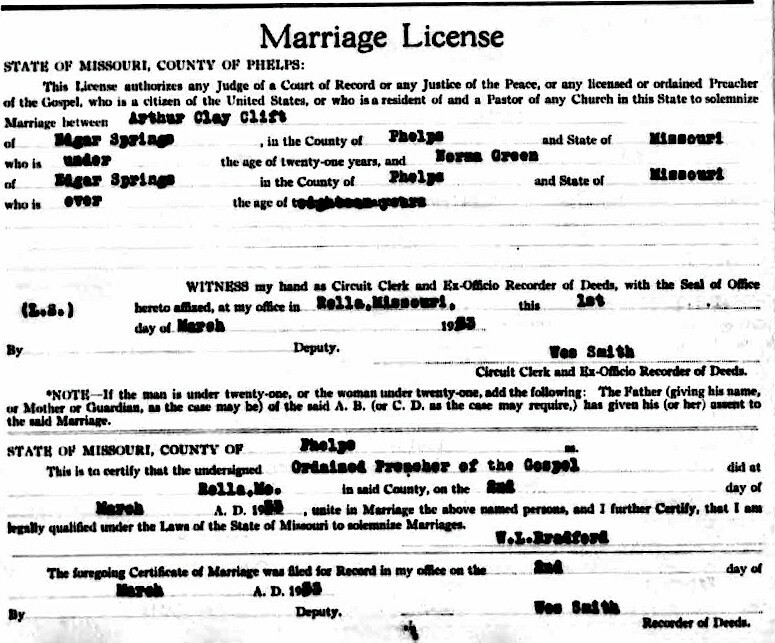 J E married Virgie Arthur on May 3, 1922 in Phelps County, Missouri. 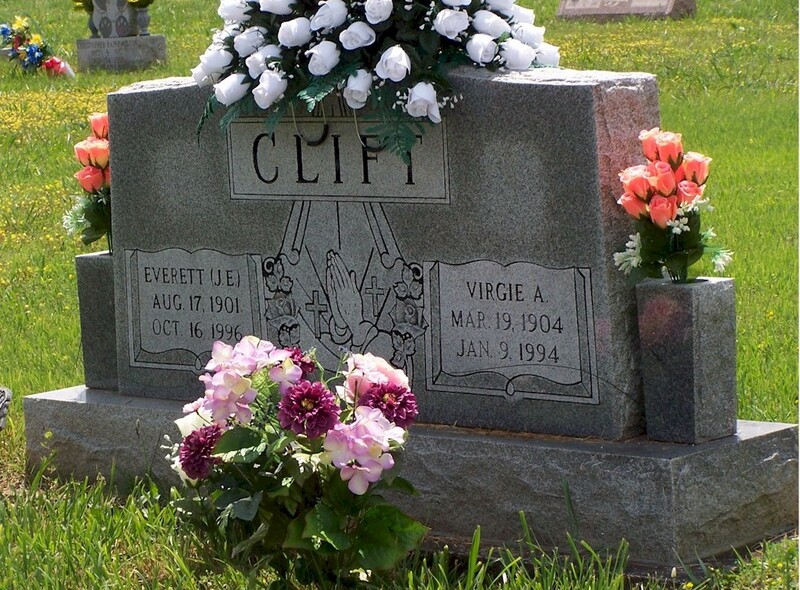 Virgie was born March 19, 1904 and died January 9, 1994. 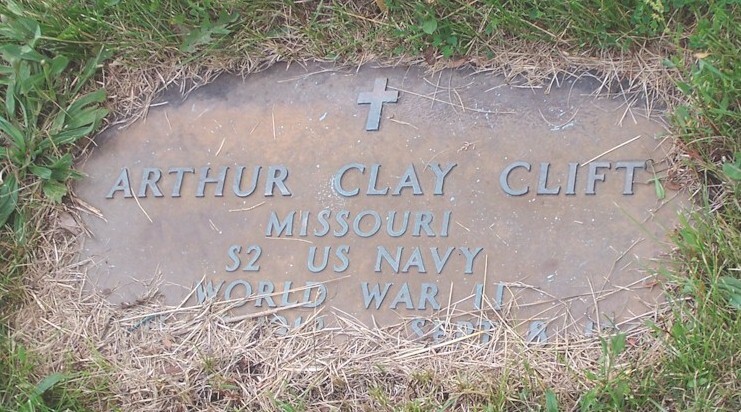 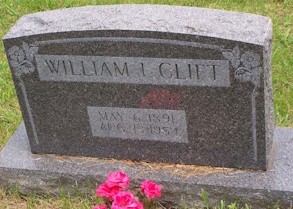 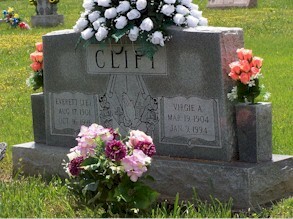 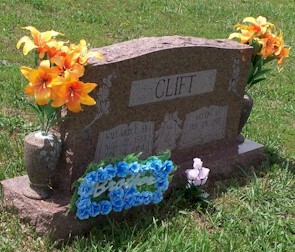 One of their children was Willard Thomas Clift, Sr. Willard was born August 27, 1933 and died January 14, 1974. 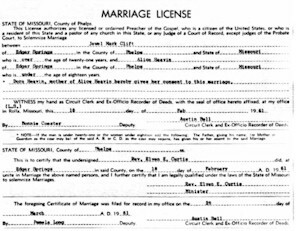 He married on September 9, 1960 in Phelps County, Missouri, Arlene Lavern Rustand.